Oueensbury really means a fortified place' but do not look for the remains in this part of north-west London. When the new Metropolitan Line to Stanmore was opened on 10 December 1932, one station was called Kingsbury. 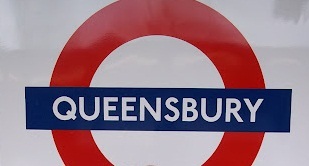 Two years later, a further station was opened and the name Oueensbury was invented for it. The station was opened as OUEENSBURY on 16 December 1934.